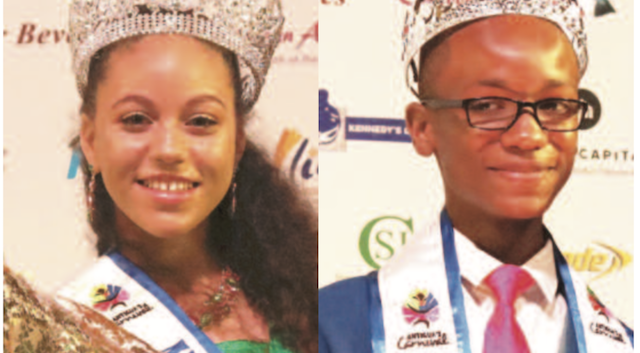 (Antigua Observer) Ending school bullying was a prevalent theme during this year’s Mr. and Miss Teenage Pageant. With five of the 14 contestants seeking to end school bullying, the winners of the Mr. and Miss Teenage Pageant told OBSERVER media that the issue must be addressed. In an interview, Mjolnor Messiah, contestant for St. Joseph’s Academy and the winner of the title Mr. Teenage Pageant 2018, said that bullying needs to be stopped in school. “I believe that young people should stopping bullying and it is a major issue to be dealt with,” he said. During the question and answer segment of the pageant, Messiah expressed a desire to create a study group with the aim of improving academic excellence. “It is important to me because I love helping others and seeing others going down and failing is not an option for me. It is just in me that I must go forth and help,” he said. Rhea Watkins, winner of the title Miss Teenage Pageant 2018, also believes that school bullying is a major issue and promoting gender equality can help to address it. “I do think it is an issue; it is out of control” she said, adding that the school she currently attends – St. Anthony’s Secondary School – has done an excellent job at thwarting school bullying. In expounding about her own unique platform, Watkins said that her platform will be to establish a youth activism group to be named “Fifty-Fifty” and will focus on gender parity. “It will be called Fifty-Fifty and it’s to raise awareness of gender inequalities because I feel that we do focus on women and women power but there are men in the world who do get brought down a lot,” Watkins said. In the female category, Watkins not only won the title Monday night, but also won Best Female Personality Profile and Best Performing Female Talent. The People’s Choice Award went to Sierra Letlow, representative for Clare Hall Secondary School, who was also Female First Runner Up. The winner of the question and answer segment in the female category was Sheronia McAlmont, representative for the Christ the King High School, who was also Second Runner Up. Messiah took home all the awards in the male category for Best Personality Profile, Best Performing Talent and was the winner of the question and answer segment in the male category. The Male Second Runner Up was Glenfield Brann, from St. Mary’s Secondary and Male First Runner up was Romario Hughes, from Jennings Secondary School.